BBQ will be held from 6.00pm. Carols Service at 7.00pm, Includes Giving Tree, with gifts donated to Anglicare. All are welcome to stay for supper. a BBQ will be held from 6.30pm, all welcome. Includes Giving Tree, with gift donated to Anglicare. All are welcome to stay for supper. 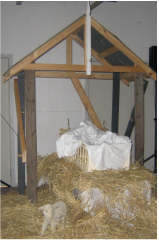 We have costumes, so children can dress up and have their photo taken in the stable with baby Jesus. a BBQ will be held from 6pm, all welcome. Carols by candle light this year are on Sunday 21st, at 7.30pm, a BBQ will be from 6pm, all welcome. Usually held on Sunday evening week before Christmas. Our numbers at this special service have grown and we now have Carols by Candlelight in the Big Hall at 21 Beatty Street. In 2013 we had a special dedication and thanksgiving for our spruced up buildings, with sausage sizzle and live music. Angela Eynaud organised another amazing service, 9 lessons and carols. For the children there was decorating and lighting of the Christmas tree, placing presents under the tree (go to Anglicare), lighting of the candles and a special visit by Mary and baby Jesus, and three wise men! Children were able to have their photographs taken with baby Jesus in the manager. We had beautiful singing by the Tongan Methodist Church choir.